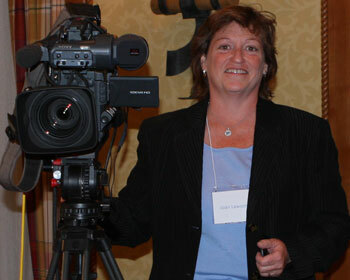 M. Joan Lawson has worked in the Broadcasting, Film, and Cable industries for over twenty five years. She is an accomplished producer, director, videographer, and editor. She has successfully run Lawson Film & Video Productions since 1992. Lawson has been nominated for a regional Emmy, won 2 International Telly awards, was the recipient of The National Communicator in 1996 and 1999, won the Award of Distinction from the National Videographer's Awards in 2000, 2001, 2002, 2003 and 2004, and won top honors, "The Award of Excellence" in 2005 for editing and shoot-ing "The Sandcreek Massacre" demo which has aired nationally. Joan has worked with PBS, CBS, ABC, NBC, FOX, ESPN, A&E, and local networks including KUSA, KTVD, and KMGH. She has produced, directed, written, shot, and edited programming on a national and local level. She shot the pilot series Today's Woman for The Discovery Channel which is now in its fifth year of production. She has served as the Director of Photography for many productions, documentaries, news, entertainment and training programming. Joan has created national branding and design "looks" for numerous companies. She has worked as a producer, writer, videographer and on-line video editor, creating graphics, national commercials, short form programming, documentaries, on-air and sales promotions, video news releases for the pharmacuetical industry, film and marketing materials, movie trailers, corporate video training, legal for courtroom cases, and special presentation reels.